I attended an event in Minneapolis on March 11th in a room full of victims of gun violence. The event was sponsored by Mayors Against Illegal Guns to call attention to the lack of background checks on all gun sales. A provision in the original Brady Law, enacted in 1993, was put into the law so that occasional private sellers of gun collections, exhibiting at gun shows, would not need to require buyers to get background checks. Gun shows today are typically large events with hundreds of displayers and sellers of guns coming together for a week-end event where people can buy and sell guns. There are private (unlicensed) and licensed dealers at these gun shows. In many cases, they sell similar or identical guns as the licensed sellers requiring the buyer to undergo a background check through the National Instant Check System, established after the Brady Law was signed into law. Some who sell at gun shows are more than occasional sellers of private collections. They exhibit at all of the gun shows in their area with large quantities of guns which do not really qualify as private collections. They are in the gun selling business and make lots of money every year selling these guns. So in my previous post about background checks, I provided a sampling of national polling showing support by gun owners and non gun owners for requiring buyers of guns to undergo background checks. As it happens, many people think that these background checks are already occurring and when informed otherwise, are surprised. Once educated about the lack of background checks on all gun sales, the public is generally in support of provisions to close this private seller loophole. Many of these sales, of course, occur at gun shows. Some are private sales that happen through on-line sales, at estate sales or auctions or at kitchen tables. So the problem here is that some people have to have background checks and others do not, depending on the venue and the seller. This creates a system of "loopholes" to the intent of the Brady Law which was to make sure that buyers of guns who should not be able to have access to them are prevented from getting them. Since the Brady Law was passed, close to 2 million people have been stopped from buying guns from licensed sellers. These would be felons, domestic abusers, minors, drug abusers, those who are adjudicated mentally ill and others. Now that gun shows are known to have a percentage of private sellers whose sales could be to anyone of a number of prohibited purchasers, we have a problem. The pro gun folks don't believe that guns sold at gun shows are used in crimes so therefore, we should not put any restrictions on those private sales. On the face of it, this just not make sense. If a number of guns sold at gun shows are sold without background checks by private sellers ( estimated to be about 25-40% of total sellers on average at gun shows), how could it be assumed that these guns would not be used in crimes? The onus should be on the gun guys to prove that these privately sold guns do not end up being used to shoot someone. The law of averages alone would find it unbelievable that if a certain number of guns purchased from licensed dealers are used in crimes ( as gun traces prove) then a certain percentage of guns sold by private sellers would also be used in shooting crimes. The ATF monitors licensed sellers, though not often enough due to lack of personnel and funding, but there is no requirement to monitor unlicensed sellers. Since they are not monitored, how do we know who gets the guns sold by them? There are no records of sale. If the guns sold by private sellers were sold only to people who could pass background checks, there would be a better way to find out if they are, indeed, used in crimes. At that point, the seller's practices concerning to whom they sell could be called into question. Is that private seller selling to felons or domestic abusers often? Does the seller have reason to believe the person buying is a prohibited purchaser but sells to them anyway? If you look at some of the videos below, you will hear and see private sellers selling without even checking a photo I.D. and certainly not interested in the status of the buyer. Follow the money. If a sale can be made, it's good. People who should not have guns get them anyway at gun shows in states that allow sales with no background checks from private sellers. There have been bills in both houses of Congress to close this loophole. This would not affect law abiding gun owners but the gun lobby is against the bills anyway. I am befuddled at the fierce opposition to a bill designed to protect future victims of shootings. It does not make common sense to be opposed to these bills. Who is protected by opposing such bills? That is an important question. It seems to me that the wrong folks are protected by just enforcing the laws already on the books. We have only a few federal gun laws in America. There is a confusing "witch's brew" of state gun laws making it more difficult to prevent illegal trafficking of guns from a state with laxer provisions to a state with stricter provisions. It makes it more difficult for the ATF and for Law Enforcement. To simplify the system, one federal law to prevent private sellers from selling their guns to prohibited purchasers would make it more difficult for criminals and others to "legally" get guns. I have posted before about the numerous hidden camera videos and studies about this private seller loophole. They are debunked by the gun lobby even though the evidence is there for all to see. Below is a list of the studies and videos. A few days ago, I met Omar Samaha at the Mayors Against Illegal Guns event in Minneapolis. He is a soft spoken young man who is touring with the fix gun checks truck. Omar's sister, Reema, was murdered in the Virginia Tech shootings. The shooter, Seung -Hui Cho, should have been prevented from buying his guns through a licensed seller, but he wasn't. Why not? A provision in the Brady law is that those who are adjudicated mentally ill should have their names sent to the NICS. It turns out that those names are not being reported. Shamefully we have allowed mentally unstable people to get guns legally from licensed dealers because of flaws in our system. President George W. Bush signed a law that now requires states to send the names. Are those names in the system? Not really. Only about half of the names that should be there are now in the system. There is a cost to doing this and system must be set up in each state to determine how those names will get to NICS. There is also a cost with potential loss of life if the names are not there- a cost we don't often take seriously. Back to my first sentence. The Minneapolis Star Tribune posted this story about the event at the Minneapolis City Hall yesterday. Here is a photo of Minneapolis Mayor R.T. Rybak speaking at the event showing the many victims and others in the crowd. If you look closely, you can see me standing to the left of the Mayor as I get ready to speak about how sometimes law abiding gun owners shoot people. My sister's shooter, her estranged husband, was not adjudicated mentally ill nor had he been arrested for domestic abuse prior to the shooting. We learned after the shooting about his undiagnosed depression and other mental illness. He would not have been a prohibited purchaser of a gun. But too many other cases end in death when an abuser has a combination of mental illness, anger, loss of power and control in a divorce or other issues. If local police are aware of these domestic abusers, ( if arrested or served with an order for protection) at least in Minnesota, they would be denied a permit to acquire a handgun or assault weapon because local law enforcement would know of those arrested for domestic abuse or those who are dangerously mentally ill; these names take a while to be reported to NICS. This is the value of having local law enforcement involved in background checks that can catch certain people that would not be caught by licensed firearms dealers in a routine background check. As an aside, before I go on, it is important to point out that some of the 550 Mayors who have signed on to the Mayors Against Illegal Guns effort have been threatened and some have decided to leave the organization because of the push back they have received from the uber powerful NRA and it's many members. This Lewiston, Maine Mayor has spoken out about a letter he received from a Patriots' group in Florida, "threatening" him with making sure he is not re-elected. So now people in Florida get to decide who is the Mayor of Lewiston, Maine? This brave mayor spoke out against the tactics of the group saying: " Unfortunately, I believe Mr. Lange of Patriots’ Ink has it wrong as to which group I belong to. I belong to the majority group of Americans who fully support good, reasonable gun legislation. It is also most unfortunate that many politicians are fearful of organizations that threaten them if they were to vote to support good gun legislation. They are fearful of the money and threats that are used to try to defeat them." Read the mayor's passionate words and his reasons for supporting closing the private sale loophole. Good for him. These bully tactics are now being exposed, thanks to strong mayors and the many people who agree with them. Mayor Rybak has been brave enough to stand up for what's right and, I'm sure, has taken some flack for his positions. St. Paul Mayor Coleman and my own Mayor Don Ness are also brave men for standing with the victims and the right thing to do. One shouldn't have to be brave to take this stand. It is common sense and basically a no-brainer. But I digressed. I brought a bell to the event yesterday. 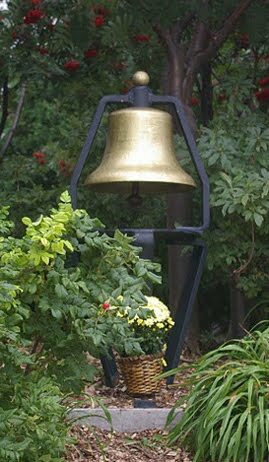 It is a bell that our local chapter has used for many years now to honor lost lives due to bullets. We have the only memorial bell garden dedicated to victims of gun violence in the country. It is in a beautiful sight above the Lakewalk on Lake Superior. There is a photo of it on my blog home page. Many people have rung the bell there in somber events to memorialize a lost loved one or friend. It is a meaningful moment for many who have not done anything like this before. The bell I brought to the MAIG event is from the original Bell Campaign, formed to support gun violence victims. Yesterday, many who had never spoken out before or had come to a public event rang the bell and said the name of the person they honored. Tears streamed down the cheeks of some who said the name of a brother, sister, father, son, daughter, friend, etc. The mother of a fallen police officer, St. Paul Sgt. Gerald Vick, gunned down on a St. Paul street, hugged me as she said his name and rang the bell. A young boy stepped forward to ring the bell in memory of his Dad. I remember his face as he remembered his father. That is what this is all about. New England Journal of Medicine research article about gun shows and gun laws. video of New York city sponsored hidden camera investigations of gun shows in the U.S.
ABC's 20/20 show follows the brother(Omar Samaha) of Virginia Tech shooting victim, Reema Samaha, as he walks into a Virginia gun show and purchases 10 guns in one hour without a background check. This University of California Davis also did an undercover video of gun shows all over the country. These videos show clearly how easy it is for anyone who wants a gun to get one at a gun show without a background check. I provided evidence in polling data in my previous post. Now I have provided some facts about background checks, including actual video of what happens at gun shows. I know we can tighten up the system to make sure that all buyers of guns go through background checks and therefore, prevent potential shootings. Closing the private sale loophole will not solve all of the problems. There are various ways in which felons and others who should not have guns gain access to them. But gun show private sales do provide some of that access. As the 20/20 video of Omar Samaha buying his guns clearly shows, guns can be purchased while standing in line for a gun show and from the trunks of cars once purchased inside. In a matter of minutes guns can go from legal sales to illegal. All guns start out as legal purchases- even those bought without background checks at gun shows if states allow it.They are legal because we have not made them illegal. 17 states have closed the private seller loophole. Current bills in Congress would do just that. H.R. 591 in the House of Representatives is sponsored by New York Congresswoman Carolyn McCarthy. On the Senate side, Senator Charles Schumer, also of New York, has introduced a bill that would assure that names of dangerously mentally ill people are sent to the NICS, penalize states that do not provide that information and require all gun buyers to undergo background checks. Common sense!! Wow, what a long article. I almost didn't make it to the end, but felt that I owed it a thorough review before posting a comment. Glad to hear that you had a nice weekend discussing guns. I had a nice weekend with guns as well, although, as you can imagine, along a slightly different vein. "This would not affect law abiding gun owners but the gun lobby is against the bills anyway." Actually it would. I have purchased two of my guns through "private sellers" (friends who wanted to sell a gun they no longer wanted). I have also sold two guns that I no longer wanted (sold some hunting rifles because I don't hunt, I wanted to save up some money for my AR). Sometimes I know you wonder at gun owners' fierce oppostion to the ATF. I've heard the stories of abuse at the hands of the ATF, but saw firsthand just how dishonorable their organization can be when I bought my first gun through a private seller. He wasn't aware of the laws between private sellers, so he called his local ATF office to ask if a private sale was legal or if he'd have to get an FFL to do the transfer. The ATF told him this was illegal, so it must me transferred through a dealer. I knew this wasn't true, and asked him to look into it. When he checked into finding a dealer, they confirmed that the ATF did indeed lie to the man. This is why you won't catch much sympathy from me over calls to investigate and reign in the ATF. As far as I'm concerned, they're one agency we could get rid of and delegate responsibilities to other law enforcement organizations. "I am befuddled at the fierce opposition to a bill designed to protect future victims of shootings." Well there is the whole "innocent until proven guilty" nonsense we have in this country. I think that bills designed to prevent future crimes usually infringe on this outdated idealism. There is also the whole "slippery slope" issue. I've not found one gun law which you don't describe as "common sense" and "reasonable." Quite frankly I can't forsee any gun law which you wouldn't describe as such. If I may point out, in the UK where handguns are banned, semi automatics are banned, private gun owners are licensed and registered, purchase of a firearm must require "proof of need" and permission from the govt, they are still calling for more restrictions. And they always call those restrictions "reasonable" and "common sense." Are there any gun laws which some on your side wish for that you, personally, would find unreasonable? I have my doubts. "17 states have closed the private seller loophole. Current bills in Congress would do just that." Well there is host of tenth amendment issues to deal with here. I've noticed that many organizations dedicated to "safety" tend to bypass the states and just seek a federal ban on whatever it is they happen to oppose. I can't say that I blame them, because it is certainly much easier to lobby for a law with one legislative body than all fifty of them. Now Illinois has two senators and fifteen (if I recall correctly) representatives. This means we have seventeen individuals in Congress to represent the will of Illinois. Compare that the the Illinois State Assembly, which has many more representatives which are much closer in tune with the wishes of their constituents. Seems to me that bypassing our state assembly would be counter to the "democracy" which you seem to love so much. I admit, it is harder for me to drum up opposition to the ban on private sales (because hey, I'll pass a background check) than it is for something that affects me directly like a ban on high cap. magazines or a semi automatic ban. But once again we return to the whole slippery slope issue. Ban private sales, and there will be another "reasonable common sense" restriction on the horizon. I didn't actually spend my week-end discussing guns. I have other things to do in my life. I'm sure you were so greatly inconvenienced having to go through a background check. What's the problem with it? Can you pass one? The slippery slope has gone the other way, of course so that we have fewer and fewer sensible gun laws and guns carried in more and more places by just about anyone. Good for the UK. I'm all for it. I find the gun laws passed allowing guns in National Parks and on Amtrak unreasonable. I find Shall Issue CCW laws unreasonable. I find state laws that do not require background checks or training in order to get a permit unreasonable. I find the legal sale of guns to anyone without a background check unreasonable- that is a part of the Brady Law that is unreasonable. 17 states have "closed the loophole". are they safer, because of that? Are their levels of violent crime lower than states that haven't? Did their levels decline, after they did so, compared to the states that haven't? Which means, that setting aside issues of federalism and civil liberties, these policies don't work. Actually jdege, gun deaths are lower in quite a few of those states. "I find the gun laws passed allowing guns in National Parks and on Amtrak unreasonable"
You are aware that firearms are/were already legal to be "on" airplanes before the Amtrak legislation, right? You're aware that passengers on both trains and planes must CHECK their UNLOADED firearms with their baggage...right? There are private (unlicensed) and licensed dealers at these gun shows. We call unlicensed gun dealers "felons"
Yes, Pat- The change, ordered by Congress, brings Amtrak's firearms policy in line with air travel rules that permit unloaded guns to be stored in locked baggage holds, the paper says. Amtrak officials say train cars are being reconfigured to accommodate gun storage." Unlicensed gun dealers fall under the category of legal sellers at gun shows in many states. Unlicensed gun dealers fall under the FEDERAL laws and the BATFE not one state can allow this because it is a federal law. Anthony- what is it about your not believing that unlicensed sellers sell their guns legally in many states at gun shows without background checks? That is the national law but some states have closed the private seller loophole making it illegal. "The slippery slope has gone the other way, of course so that we have fewer and fewer sensible gun laws and guns carried in more and more places by just about anyone." I think it's only fair, really. During the last few decades, in the Clinton years especially, gun owners played the defensive. Now you guys know what it's like. Here's the thing though, while we simply wanted to be left alone, your side sought to regulate what gun owners do. We have never had a problem with someone not owning a gun - I think maybe it's time to change that. We've seen what has happened in Kennesaw when they mandated gun ownership. We know the low crime rate in Switzerland with their mandatory citizen militias. Maybe it's time to see how your side would like being forced into gun ownership? "Good for the UK. I'm all for it." That is why we know your side will never quit. You will never be satisfied with the laws on the books. You will campaign for more and more. Once one gun law is passed, we will have another one that is necessary to keep us safe from those evil guns. And on and on. It'll never stop. Wonder why we don't compromise?
" find the gun laws passed allowing guns in National Parks and on Amtrak unreasonable." I've always been puzzled by your side's opposition to these laws. So if a Nat. Park is in the center of a concealed carry state, somehow a visitor who travels, say, three hundred miles through concealed carry territory to get to the Nat. Park is somehow unsafe now that they are out in the woods? More unsafe than the gas station they stopped at along the way? More unsafe than at the restaurant they ate at for breakfast? As for Amtrak... you are worried about an unload gun inside a locked case stored away in the baggage area that is inaccessable to passengers? Am I missing something? This is the way firearms are transported on airlines. What more could you want? The passengers themselves are unarmed. "I find Shall Issue CCW laws unreasonable." So you wish for there to be subjective data brought into the equation so the whims of an individual can be used to deny permits? Maybe I had a sign in my yard that supported Sheriff Smith and not Sheriff Jones? Now that I applied for a permit, and all my checks came back clean, Sheriff Jones doesn't want to give me one. But that won't happen, right? "I find state laws that do not require background checks or training in order to get a permit unreasonable." Perhaps then you could explain to me why your organization is currently against the Illinois concealed carry law, which mandates all these requirements prior to issuance of a license. You've opposed previous may-issue licensure, as well as home rule exemption. What is the matter? So basically there is no gun law that you find unreasonable? Wonder why our two sides can't come together on anything? japete - an unlicensed dealer is a felon. Sebastion is exactly correct. An occasional seller, who sells one or two guns to buy something else, is not a dealer. And I don't care how many laws you pass, you can never eliminate that. Personally, I prefer to buy as many of my firearms as I can from individuals rather than dealers. No paper trail. Give private sellers access to NICS and require them to use it. Problem solved. Ah here is the difference you said DEALERS there is a federal law against that. If I buy a rifle from a father or friend they are not a dealer or some guy selling at a gun show. I think this statement illustrates where you really stand and what you really mean by "reasonable gun laws." "I'm sure you were so greatly inconvenienced having to go through a background check. What's the problem with it? Can you pass one? The slippery slope has gone the other way, of course so that we have fewer and fewer sensible gun laws and guns carried in more and more places by just about anyone. Good for the UK. I'm all for it. I find the gun laws passed allowing guns in National Parks and on Amtrak unreasonable. I find Shall Issue CCW laws unreasonable. I find state laws that do not require background checks or training in order to get a permit unreasonable. I find the legal sale of guns to anyone without a background check unreasonable-"
If I understand you from your statement you are opposed to anything that removes any restrictions no matter how ineffective from gun owners and support anything that adds restrictions no matter how ineffective. Now, if I give you the one about background checks and training for a permit, can you explain without getting snarky how I am wrong? "Some who sell at gun shows are more than occasional sellers of private collections. They exhibit at all of the gun shows in their area with large quantities of guns which do not really qualify as private collections. They are in the gun selling business and make lots of money every year selling these guns." If they are buying and selling guns for the purpose of making money as you suggest, then these folks are breaking the law and should be prosecuted for it. There is no reason to ban all private transfers because of these criminals when all it would take is the enforcement of the current law. "Actually jdege, gun deaths are lower in quite a few of those states." And higher in others. And again, "gun deaths" are not the relevant measure. The issue is criminal violence, not guns. There is simply no evidence that gun control measures aimed work. Alcade- " Maybe it's time to see how your side would like being forced into gun ownership?" I'm sure that was tongue in cheek. I prefer the May Issue permiting for CCW because it worked quite well. Local L.E. know their communities well. My Sheriff would like to be able to deny someone for "dangerousness". He is not wanting this to punish people like you but because he can't deny for this reason, there are people in our community who are getting permits who he considers to be potentially dangerous folks. That is what I'm talking about. I'm sure you are safe ( or I hope so) with your guns in public. I still don't know why you need them in every place you go. I have made it this far in my life without fearing that someone is going to attack me in the grocery store or the Mall or at a hockey game. Thankfully those are rare incidents. In most cases, someone with a ccw permit has not been able to stop the shooting or defend him or herself or others. I would rather support measures to keep guns out of the hands of as many of the people who shouldn't have them in the first place. It's all about prevention. You still have not mentioned why the laws passed in the Clinton Presidency have hurt you or those you know. Anon- many unlicensed sellers are, indeed, dealers. I did not make that up. Are you a felon? Anthony- many displayers at gun shows deal in their guns at many gun shows a year with their own huge collections. They are dealers. They are doing it to make a living. In several of the hidden camera videos, people said they make a lot of money dealing their private collections. Robin- what do you mean by ineffective? "in a room full of victims of gun violence. " I was there too... Full of victims? There were about 50 people there, and 1/2 of them were press and City Hall employees. I'm willing to bet most of the others aren't "victims" (such as the MADDADS guys) just supporters of your cause. "Robin- "what do you mean by ineffective? Cute, you didn't answer the question. So I will rephrase it. Are you you are opposed to anything that removes any restrictions from gun owners and do you support anything that adds restrictions no matter whether it produces a measurable benefit or not? No, not good for us. Not good for anyone. Our laws use criminal actions as an excuse to penalise law-abiding innocent people. There's no such thing as "sensible" when you're talking about something like that. "Irresponsible" almost definately, but "sensible"? Never. As to the topic at hand, it would be far more sensible to open NICS access to private sellers as well. lets stay with a simple case.. I own an assortment of guns in all ways legally (assume as I don't currently) and die of a heart attack. My partner wants to sell them but does not have FID or FFL and it's here in MA land of restrictive gun laws. Legally to do anything other than have the police pick them up for _free_ my partner is a MA gun law felon. If I die the values of my former property is important to my partner who is not adverse to guns but not interested. So she has to get FID/LTC before I die just so she can sell them when I die. Your sensible gun laws broke that now find a fix. My partner is not now a gun owner but should I die become an instantly unlicensed owner in a state where that is a felony with a mandatory 1 year conviction. Thats what rampant poorly conceived laws can lead too. Fat- it's legal in many states, including my own, for people I have described. If it's not illegal, they are not breaking the law. Well jdege- I count gun deaths as a good measure as to whether gun laws are working. "It's all about prevention. You still have not mentioned why the laws passed in the Clinton Presidency have hurt you or those you know." Are we talking concrete or abstract? In abstract, how does infringement of one's civil rights hurt or otherwise cause damage? Well, how much would it hurt you, ma'am, if we took away womens' right to vote? So long as you were secure in your person or possessions, I'd argue that you wouldn't be hurt at all. The females in this country may beg to differ, but not going into a voting booth every few years certainly causes no concrete damage that I can think of. As for the concrete? I turned eighteen in 2000, and would have loved to purchase a semi automatic. Unfortunately, such firearms were rare and prohibitively expensive for someone like myself on such a limited budget at the time. So in a concrete way, it would have hurt me financially. You state this is all about prevention. I have a scenario I'd like to prevent. In previous entries you assurred me that if a semi auto ban were reenacted, I'd "probably" get to keep what I already own. Ok, that's probably true. Now what happens when a spring or pin wears out and breaks? Am I allowed to purchase a replacement? Would I even be able to afford it? I'd like to prevent that. What happens when someone knows that I have a rare and expensive gun in my house? Will I be burglarized while I'm away and my gun collection stolen? What if someone see's me shooting my AR one day, and calls the police thinking I'm shooting a "prohibited weapon?" So now some jumpy police officer shows up at my house while I'm shooting and pulls a gun on me. Not a very safe situation, and it has a high liklihood of causing me harm. I most definately want to prevent that. Really anon- why didn't you come and introduce yourself. So now it's not O.K. for the MADDADS to be there in numbers because they only lost a friend and not a sister. These are people who are working to stem the violence in their neighborhoods. Victims are those who have lost loved ones or close friends. When a shooting occurs, there is a wave that affects many in the community. For instance, my sister's friends were traumatized by her shooting. They, too, felt the loss and felt like victims. Please do not dismiss this. And why don't you identify yourself? How do I know you were really in that room? Your question, Robin, is very awkwardly worded. Try again. I lived in a "May Issue" state - Massachusetts. I'm a law-abiding citizen who previously worked in law enforcement. First city I lived in was Quincy, Massachusetts where I was informed "the chief does not issue *any* gun permits". After two years, I moved to Taunton, Massachusetts where I was informed "the chief does not issue *any* gun permits". After a year, we assisted the police chief in an investigation through work - in the process we got to know each other. Surprise, surprise, I was issued a gun permit not too long later. This is what "may issue" gets you - inconsistent, arbitrary, and capricious licensing where the "favored" receive permits and others are denied. Minnesota has an outstanding gun permit law that can serve as a model for other states. If someone is conducting a business in firearms, they must have a FFL (and thus must conduct NICS checks on a sale). A person who is at a gun show selling a personally owned firearm (or two, etc) is not engaged in the business of selling firearms. Such a person is not an "unlicensed dealer". Anon from MA- if your partner is not interested in gun ownership, I would think she could bring these guns to a dealer and let the dealer sell the guns. Or can she get a background check herself for guns that were left to her in case of death? I can't answer this one since I am not that familiar with your state's laws. My point, Bryan, is that these private sellers actually become, in effect, dealers because they have large collections that they take to most of the large gun shows and sell the very same items as the table next door which is an ffl. End game her eis the partner will have to go through the registration for FID or LTC if semiautio rifle just to "handle them" without the legal owner. Its a mine filed. Come up with a scheme to close your "private sale loophole" background check issue that doesn't require firearms registration and I'd be willing to consider it very seriously, and probably support it. As an occasional private seller, I wouldn't mind having an easy, non-intrusive way other than my intuition and judgment to know if someone is a prohibited person or not. And I personally would check a driver's license and retain the info on the person I sold to, just to protect myself in the event that the gun ends up at a crime scene in the future (my name is the last one on the 4473 after all...). I do oppose expensive and useless gun registration requirements that will intrude on my privacy and waste huge amounts of law enforcement resources, though. Unfortunately, the proposed solution always seems to involve such registration schemes. The problem with this is that then NICS becomes a general way for anyone to run a background check for any reason. For example, should a landlord, creditor, or employer be able to access the database? Should people who had a misdemeanor DV conviction 20 years ago or got busted for using drugs in their youth be fired from their jobs or kicked out of their rental properties for that conduct? There's also potentially huge racial bias issues. A landlord can't refuse to rent to you because you're of a certain ethnicity. They could potentially refuse to rent to you because you're a prohibited person (just like they can refuse to rent to you if you fail a credit check). Due largely to the "war on drugs" and other socioeconomic factors, disproportionate numbers of minorities have criminal records that make them prohibited persons. While criminal convictions are already often readily available in public records, you can end up on the prohibited persons list for a lot less than a felony. We've also seen that the appeals process for NICS errors is difficult and time consuming. Say someone who has no interest in buying a firearm is erroneously put on the list and finds out when they get a pink slip at work (nobody wants to employ a domestic abuser/felon/drug user/mental case). What's their due process protection and how do they get the list fixed? The intent of making such a database public might not be to cut off minority groups from jobs, housing, and credit, but the end result may well be. Implementation would have to be done carefully with a lot of consideration for unintended consequences. As one of the gunowners who might agree to what japete wants, I may be able to give some insight on this matter. Polls show that many gunowners agree -- yet when push comes to shove, I and most of those others wind up on the NRA side. What gives? The NRA claims it's just one part of attacks upon gun shows, and they make a good case. For example, I might agree to NICS checks for ell sales at gun shows -- but most gun control groups actually want to abolish NICS and replace it with a mandatory minimum waiting period of several days (longer than the usual weekend gun show). Also, in states such as CA which already closed the "gun show loophole," gun control advocates continue to attack gun shows by trying to ban them in the venues in which they are most commonly held. japete, if you want to win over those moderate gunowners like me who would support gun show legislation, I suggest that you lobby gun control advocates to renounce attempts to abolish NICS and to oppose attacks on gun show venues -- perhaps you should start with the Brady Campaign. Many gunowners are willing to compromise, but compromise requires effort from both sides. Thanks, Chris. I am betting that whatever passes will not have registration in the mix. I hope you can support something sensible. Thanks, again, Chris. I have tried to address those very concerns about opening up NICS to anyone. Jay F- I have personally not seen any effort to abolish NICS in all of the years I have worked on this issue. I doubt that it will happen. I don't even know where that comes from? As to attacks on gun shows- how else to show the public what is going on at gun shows in order to make change? I guess maybe the right is using some attacks of their own ( not on guns- but taping fake interviews with NPR employees and going after entire organizations such as ACORN) I don't mean this as an abstraction and don't want to have a debate about that. But in this case, what goes on at gun shows is what goes on at gun shows. When someone makes it public- is that an attack? It is just to prove that we know these things are happening at gun shows. I hope you will be willing to be with the efforts to fix the system. Thanks for the comment. Compromise is something that should involve concessions from both sides. Suppose the pro-gun side gave you background checks on private sales. What would you offer them? Would you settle for opening NICS, but not making it a requirement? I would think a lot of people might use it out of concerns for liability. I don't make deals about the gun issue on this blog. I am listening to and reading what you say but I am only one person. Between the 2 of us, I don't think we weild that much power. I don't make deals about the gun issue on this blog. I don't expect you to make a commitment for whatever group of people stands with you. However, it would have been interesting to see your personal opinion on this. If you are not willing to compromise, I would have to wonder why you would expect your opponents to do so. You certainly seem to wonder why they don't concede something to your side with some frequency. I am listening to and reading what you say but I am only one person. Between the 2 of us, I don't think we weild that much power. Neither do I. However, you constantly address your posts to "you guys". Perhaps the people posting here are individuals as well, no? "For example, I might agree to NICS checks for ell sales at gun shows -- but most gun control groups actually want to abolish NICS and replace it with a mandatory minimum waiting period of several days (longer than the usual weekend gun show)." You're not alone. I oppose background checks on private sales for civil liberty issues. I think it essential to ensure that the government does _not_ know who owns what guns. But beyond that, I oppose any federal regulation of private transactions between the residents of the same state. The feds have no authority to regulate intrastate commerce. But I recognize that there are a great many folks who are less-principled than I. A great many of them might well back a federal statute requiring background checks on private sales at gun shows, provided that was all it did. But since the Brady Bunch is clearly unable to craft such a bill, that's not likely to be an issue. Every statute proposed in Congress to address the gun show loophole would have shut down gun shows, entirely. They've done this consistently enough, over the years, that I'm convinced that is their entire aim. Remember, there have been a number of occasions where they could have passed a bill that would require background checks on private sales at gun shows. They've failed because the gun control groups didn't support them - because they didn't give the government the power to close down gun shows. "This is reasoning in a chain with conditionals where one of them is false or enough of them are dubious, so the conclusion does not follow. Typically slippery slope arguments, then, are defined in terms of a causal chain. Any argument with a chain of conditionals can be suspect. The reason may be due to vagueness, or just due to each step being a little dubious." Certainly, J.P.- when you stop putting me in the gun banners group I guess I get to put you into the gun guys group. that is total nonsense jdege. We have not ever wanted to close down gun shows. That is information that your side says my side wants and it is not true. Japete: "I have personally not seen any effort to abolish NICS in all of the years I have worked on this issue. I doubt that it will happen. I don't even know where that comes from?" It has been a stated goal of many gun control groups including the Brady Campaign to abolish NICS and replace it with a mandatory minimum waiting period of everal days or more that would be anything but "instant." You tell me: True or false? japete: "As to attacks on gun shows- how else to show the public what is going on at gun shows in order to make change?" That's not what I was referring to, which is the specific attack upon gun shows by trying to ban them in the venues in which they are most commonly held. Even more damning: This has been attempted in places like CA where the "gun show loophole" has long been closed. You know, Jay- what I love about you guys is your inability to believe me once so you have to continue to ask me the same question. I gave you my answer already. Why should I have to keep answering it. I think I may have actually answered it twice already. No banning of gun shows. CA has gun shows. They have not gone out of business as you guys claimed they would when they passed their background check law. They are alive and well. It's only a slippery slope argument if we don't acknowledge the possibility of middle ground. There may very well be middle ground, we're just not willing to risk it given the evidence. But hey, for the sake of argument, let's see which one of the following statements is false or dubious. 1. Law abiding citizens have been forced to hand over firearms (personal property, including historic pieces and family heirlooms) to the government in Australia and the UK. 2. In countries where handguns were banned, criminals still had them, but also moved on to shotguns, rifles, airguns, pepper spray, and even toy guns, and legislation followed right behind. 3. High ranking members of our own government have voiced desires and intentions to do the same here. The problem is that those who want to ban all firearms rarely come right out and say they want to ban all firearms. They hide behind, phrases like "common sense". That's not a shot at Joan, it's just the truth. Would requiring a background check for all firearms transfers result in confiscation? No. Not right away, anyway. In the UK it was 60 years from discouraging handgun applications for home defense ("common sense", some might say) to "turn them all in" in September 1997. At any time, I'm sure Brits with any common sense would have been happy to take back that first step. Because THIS was the result. "Gun crimes soaring despite ban brought in following Dunblane"
"An independent report, Illegal Firearms in the UK, to be published by the Centre for Defence Studies at King's College in London tomorrow, says that handguns were used in 3,685 offences last year compared with 2,648 in 1997, an increase of 40 per cent." That's right. An increase in 40% in the first two years after the ban. We're not just protecting a hobby. japete: "I gave you my answer already. Why should I have to keep answering it. I think I may have actually answered it twice already." Has it indeed been a stated goal of many gun control groups including the Brady Campaign to abolish NICS and replace it with a mandatory minimum waiting period of several days or more that would be anything but "instant"? If not, then I will support your gun show proposal and you will have actually converted a gunowner into supporting your position. Anon- we've gone over this before. You are wrong about what has happened in Australia and England. No need to keep going over it and over it again. You are also wrong about the gun banning but we've gone over that over and over again. Why can't you guys find a new argument? You keep using the same old stuff that was stale already a few years ago. " The Defence Studies Department (DSD) was created in 1997 as an integral part of the UK Joint Services Command and Staff College (JSCSC), which provides command and staff training at single-service, advanced and higher levels for the three Armed Services of the United Kingdom to a world class standard." And yet- how to explain this one: http://www.independent.co.uk/news/uk/crime/britain-records-18-fall-in-gun-deaths-1232069.html- "The number of deaths in Britain from gunshot wounds has fallen to a 20-year low despite concerns about levels of violent crime." and " Most of the 42 gun-related deaths last year took place in London, the West Midlands, Manchester or Merseyside, with swathes of the country recording no homicides, suicides or accidental deaths from firearms." and " The Centre for Crime and Justice Studies at King's College London said its research also suggested the number of gun-related deaths was falling since reaching a peak eight years ago. In 2008, there were 42 gun related deaths in the UK, in 2007 there were 51." We have more than that in one day in the U.S.= 80 including suicides, homicides and accidental deaths. The figures in the U.K. include the same. Jay- I have been involved with the Brady campaign for more than 10 years now and I have never heard anyone say that NICS should be abolished. I am very close to the goals of the Brady Campaign and that one has never come up in my presence or in writing. I have seen other goals that you guys don't like such as licensing and registration which is not now a part of the conversation but do come up in discussion. As to waiting periods, we would prefer longer waiting periods but I have not heard that as any part of any proposal that is supported by the Brady Campaign. The focus now is on gun show background checks and the improvement of the NICS system to make sure the records of mentally ill people get to the system. We are also in favor of banning the 30 round magazines which has come up since the Tucson shooting. The primary goal is the closing of the private seller loophole at gun shows. We would love to see background checks on all private sales but realistically know that is unlikely. We would love to see mandatory reporting of lost and stolen guns, one gun a month and a few other items. Truly, abolishing NICS is a new one. You are the first person to bring that up on the blog and the first I have heard of any suggestion. I have seen other goals that you guys don't like such as licensing and registration which is not now a part of the conversation but do come up in discussion. The primary goal is the closing of the private seller loophole at gun shows. We would love to see background checks on all private sales but realistically know that is unlikely. We would love to see mandatory reporting of lost and stolen guns, one gun a month and a few other items. You do realize that all those goals you listed probably require registration to accomplish and/or be effective, right? "One Gun a Month:" Requires the government to collect records of when you last bought a gun and hold onto that information so that you can be "blacklisted" for 30 days. Also, easily circumvented by buying from an illegal dealer. Lost & Stolen: This also requires registration. Otherwise, an illegal dealer who can no longer claim to have "lost" a bunch of guns that were actually sold to criminals can instead just say that he sold them in a private sale. Without registration, these laws are easily circumvented. As a note for definitions, I use the standard dictionary definition of registration. "An entry in a register." And a register is a "a formal or official recording of items, names, or actions." To me, if the government has a record of names, personally identifiable information (addresses, social security numbers, etc), and actions (buying guns on specific dates in specific places) or items (make/model/serial number of guns owned) then that's registration. That is what goes into a wedding registry, a car registration, or a voter registration record, and that level of detail would suffice as a firearms registry. Registries are unacceptable for a variety of reasons -- not least of all that they don't actually work at reducing crime and are very expensive to administer -- so I am quite skeptical of their effectiveness. I think it is important to differentiate here. There are two types of non-licensees selling guns: Private Sellers and Illegal Dealers. An illegal dealer is someone who is engaging in the business of buying and selling firearms for profit without a license (illegal). I'm also including people who knowingly sell to people who could reasonably be presumed to be prohibited persons (also illegal). They may not have been caught yet, but that doesn't make their conduct lawful (just like if you go 75 in a 55 MPH zone but haven't gotten pulled over doesn't mean you aren't breaking the law). If you mandated background checks they'd likely just ignore that requirement too. The other category, private sellers, want to do the right thing, especially if it is inexpensive and convenient. They will not sell to someone who they reasonably believe is prohibited, don't sell across state lines, and aren't trying to make regular profits. I think its more productive to approach the former with criminal sanctions. Existing laws on the books, if enforced, would be sufficient legal authority to nail these folks. The latter category needs a different approach. Rather than threatening the folks trying to do the right thing with punitive sanctions, making them criminals when they're victims of legitimate crime (lost & stolen) or charging them with expensive transfer fees that make it tempting to just go under the radar, it'd be better to make tools available to better understand who they're selling to. I think most folks in this category want to do the right thing, and if you make it easy for them to access more information about the other guy they will. Anonymous, as japete's comment shows, some of the numbered arguments in your post are at least dubious if not false. In fact, I think your list is a list of assertions, not a list of arguments. Wouldn't you need some specifics to back up your assertions? I think your post kind of proves my point. If you're going to make a list of assertions backed up by specifics, it would be a long one (to get from common sense gun laws to confiscation of firearms) and I think some of the arguments would be false or at least dubious. The assertion, for example, that confiscation has been done in other countries does not say anything about the US. Our gun culture here is much different than in other countries (alas). I think this point alone casts enough doubt on your assertion to make it just that: doubtful. Chris- there is evidence from the many videos of gun shows that indicate private sellers being willing to sell to anyone- no questions asked- no ID- nothing. If a background check was required in order for these folks to do business at gun shows, that would not happen. As to other measures inevitably leading to registration, that is the mantra from your side. Everything leads to registration. When we want to propose gun registration, we will propose it straight up. For now, that is not what we are doing nor do we propose anything that leads to registration by supporting bills for background checks. You guys all think we sit around rubbing our hands wondering how we can get registration in an underhanded way by passing other laws. Such is just plain not the case. That does not even enter the discussion. The folks I work with are honest people trying to do the right thing. We do not have evil or hidden intentions. I know you won't believe it because I said it. I don't know how else to put it. Many private sellers are actually dealing guns and are in the business. They are not illegal because it is not illegal to do this under current federal law and most state laws. You guys always say these guys shouldn't be doing it because it is not legal. Yet that is what is happening at gun shows all over the country. If we change the private seller loophole, we will go a long way to stop this practice and we can stop some sales to people who shouldn't have guns. That's it for us. Believe it or not. japete, thanks for the explanation. Now I will explain my position, so that we may better understand each other. "Impose a waiting period under the Brady Law, to allow time to do accurate and complete review of appropriate records." The "I" in "NICS" stands for "Instant," so adoption of a mandatory minimum waiting period means no more NICS. Is that clear now? The Brady Campaign position on a waiting period, if enacted, means no more NICS. You wrote: "It takes a few minutes to run a background check and out you go with your gun." Do you really see nothing wrong with telling us that we shouldn't mind because it only "takes a few minutes to run a background check and out you go with your gun," while it is your group's stated goal to do away with checks that only take a few minutes? That is the problem, and it's what holds me back from supporting your position on gun shows. O.K. Jay. I had not seen that press release. What Paul Helmke was doing was giving a "laundry list" of things the Brady Campaign thinks would work to reduce gun injuries and deaths. Yesterday I gave you a laundry list of things I would like to see. I realize that my list will not survive the fight nor will Helmke's. We will pass measures that most can agree on. If we can prove that others would work without affecting gun owners rights, then we will talk later. The current bills on the table do not deal with changing the waiting period or getting rid of NICS. You didn't see that one on the list did you? I know you guys fear having to wait for more than a few minutes to get your favorite gun. Why? Unless you are planning to run right out and kill someone it shouldn't bother you. And, by the way, that is why the daughter of a friend of mine is now dead. No waiting period or background check for a domestic abuser with an order for protection. He bought his gun at Walmart and within hours, her daughter was shot to death. Ask her about waiting periods. Cooling off periods is more the idea. Given all of that, we are not moving forward with any plan on waiting periods. Honestly, I will say that at some point in the future it might come up. Then there can be discussion of it as it goes through the Democratic process. Isn't that the way these things work? You are afraid of one thing and I am afraid of another. We can hope the process works. You think it hasn't worked for you on some issues and I think it hasn't worked for my side. Somewhere in the middle is the actual truth. Anon- I am not going to publish your "research" showing opposite figures from mine about the UK. then I will, of course, find something that refutes you and you will find something that refutes me. The truth is that the UK has almost no gun deaths and you can't even begin to compare what happens there to what happens in our country. This discussion is a dead end and will not serve to add to what we are talking about here. No sense going around and around and around with competing data. The data that counts is the numbers of gun deaths per 100,000 as recognized by the CDC and most of the world. The world knows that gun deaths in our country are astronomical compared to any other country not at war. Thanks, japete. Now we know where we stand. I wanted to give you some insight into why gunowners like me who would otherwise support gun show checks don't get behind it, because they find out what gun control advocates intend to add on after that is much less reasonable (to gunowners) than the first step that's now on the table. You quoted a poll: "86 percent favor instant computerized background checks for every gun buyer." I find it somewhat deceptive to quote that to gunowners without letting them know that that you hope and intend to do away with the "instant" part. I certainly hope that you will stop telling us that we shouldn't mind because it only "takes a few minutes to run a background check and out you go with your gun," since it is your group's stated goal to do away with checks that only take a few minutes. Perhaps what you are saying is this: "We want mandatory minimum waiting periods instead of NICS, and as soon as we can we are going to try for it, but we probably won't get it, so don't worry about it." Sounds kind of silly, though. Jay- for the very last time-- THERE IS NOTHING IN THE BILL THAT WOULD DO AWAY WITH THE INSTANT CHECK SYSTEM! Forget that. It is simply not true. Do not bring it up again. I have no further answers. You were likely setting a trap for me to fall into by pretending to be reasonable and then you jumped in with your accusations. I'm not playing this game any more. "Honestly, I will say that at some point in the future it [waiting period] might come up. Then there can be discussion of it as it goes through the Democratic process." Please take a moment to carefully reread the last few posts and ask yourself how any reasonable person could draw any other possible conclusion from this? That is what we mean when we tell you we can't support your so-called compromises. Your organization has in the past supported far more draconian measures than they are currently, and you yourself have even admitted to the same (such as admiring the lapsed AWB, UK's gun ban, etc). When asked about banning guns, or your organization's plans for the future, all you'll say is "Heller/McDonald settled individual 2A rights and took gun bans off the table," not "Our organization doesn't support a collective/militia right interpretation and we don't want a gun ban." The obvious implication of the difference in these two statements is that as soon as the make-up of SCOTUS or the balance of power in Congress shifts in your favor, these things will suddenly be back in play. I have asked you before to deny those positions in the second, unequivocal manner, but you still refuse to do so yet wonder why we don't believe you. Your denial has followed that exact same formula every time you use it, so I know that you are doing it intentionally for the reason that I mentioned; your denial has become so formulaic that you needn't bother to repeat it again here now. I assume that you are an intelligent woman who is saying things the way you do for a particular reason; please give me the same courtesy and not treat me like an idiot who can't read between the lines of your writing. There is nothing in your gun show bill that would do away with the instant check system. Is it not nice that we can agree? It's the Brady Campaign's clearly stated desire to LATER do away with the instant check system (by pushing for a mandatory minimum waiting period) that is the problem. But again: There is nothing in your gun show bill that would do away with the instant check system. Jay- again we have a semantics problem. You guys are exaggerating, as you often do, what the intent of a longer waiting period is. There is no intention of getting rid of the FBI system to check on whether a buyer is a prohibited purchaser. What you are objecting to is that if, in some alternate world , something actually passed through Congress that would make the checks other than "instant" it means to you guys that NICS will be eliminated. That has not been discussed by people on my side. The system would always stay in place. If, as I said- a very big if- hell would likely freeze over first- the system changed to increase the "instant" to a day's time instead of a few minutes, maybe the system would be called the NCS?? Really- this is not being discussed in any meaningful or serious way that I know of. Let's focus on doing something we can agree to do. If the NICS system is changed so that you cannot walk into a gun store and walk out with a gun - if the approval process becomes lengthy enough to require two trips to the gun store, then yes, NICS would have been eliminated. An instant check is a minor inconvenience. A waiting period is in intolerable violation of fundamental rights. jdege-" ntolerable violation of fundamental rights. " Find me something in the Constitution that grants you the right to have your gun immediately. It is not mentioned and therefore you can't say that any such provision would violate your fundamental rights. You guys seem to have expanded the 2nd Amendment to your own liking. "Find me something in the Constitution that grants you the right to have your gun immediately." Remember that bit about "life, liberty, and the pursuit of happiness"? People have been killed, because of waiting periods. People have been killed for the lack of waiting periods. Name me one person who was prevented from committing a crime of violence, because of a waiting period on retail gun purchases. Semantics? Perhaps, so let's be clear -- words have meaning. If you enact a 3 or 5 day (or more) Waiting Period, you no longer have NICS (National INSTANT Check System) -- maybe you have a NWPCS. I showed you that such is a official stated goal of the BC -- and even you are now defending such on this blog. You cannot do that and then tell us it only "takes a few minutes to run a background check and out you go with your gun,"when it's your intent to change that later. Yes, I know you are not doing it NOW, but it's undeniably a goal for later. And saying (in effect) that "We want it but probably won't get it" is not at all reassuring. I agree that we may have come to the end here. I and other moderate gunowners who polls show would support gun show legislation could buck the NRA and make the difference if there was a compromise in which we were assured that such a law would not later be follow by a push for another law that would do away with the "instant" part of the check system. But you make it clear that won't happen so the fight goes on and nothing gets done. I already mentioned the daughter of a friend who would likely be alive today if her estranged husband had had to wait for 24 hours to buy his gun. Currently, Jay, it only takes a few minutes for a background check so yes I can say it. "Currently, Jay, it only takes a few minutes for a background check so yes I can say it." Yes, you can say it. And some foolish gunowners may even believe that you won't try to change it later when you see the opportunity. But enough gunowers are educated enough about the issue to know better, and that stands in the way of any compromise. Well done. Lobbyists from the NRA and other gun groups are the only reason common sense gun laws don't pass. As long as they put the fear of guns into the minds of conservative Congress people, little will be done. Even the Democrats are running from common sense.